In order to help future patients understand what it’s like to have an MRI in our open MRI scanner, we have put together an overview of some of the latest feedback we’ve received from patients. Our non-claustrophobic MRI scanner allows patients to relax while having the procedure. It is much quieter than standard MRI scanners, and patients can hold a family member’s or friend’s hand throughout the scan. 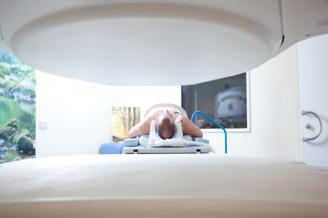 Have you had a closed MRI scan before? If so, can you tell us how the experience compared to the open MRI? Newcastle Clinic accepts NHS referrals for claustrophobic and obese patients from anywhere in the UK, as well as private patients who have health insurance or are self-funded. Please contact us with any questions about the open scanner or our diagnostic imaging services. Do you have a review you’d like to share? Visit us on Facebook or leave feedback on our website! I have had two bad experiences due to a ,MRI, Scanner …one leading to a huge nose bleed …I have Spina Bifida, Spinal Tethered Cord and Brain Aneurysms….but I suffer from claustrophobia …I can not have an MRI scan unless I am under anesthetic…..but a while a go I had a Spinal check on an open scanner in your clinic but when I went for the results they Consultant Mr Nissen at the RVI had to look at my old MRI scan pictures because he said the open scanner doesnt give a clear image it is a weaker picture , is this true ? and if so what is the point of the open scanner ……I need another MRI soon on my Brain and have to go under anesthetic which I wish the Open Scanner would have been more appealing to me ……please advise…. Many thanks for your recent enquiry. We have responded via email but the email address bounced back. I can see you had your MRI scan with us on the 21st March 2016, there isn’t an issue with the open Scanner or the images we receive all NHS referral for Claustrophobic and obese patients in the North east and Scotland. This scanner is ideal for patients who can’t tolerate the tunnel scanner, the images are only going to be of the best quality if the patient doesn’t move which I appreciate isn’t always possible due to anxiety. Mr Nissen has referred his patients to us for many years now, and if there was an issue with the quality I do believe he would have told us. I’ve had our MRI department check a few of your images and they were of a diagnostic quality. I had a mrI scan in a mobile van on Tuesday, the visit did not go well I was unable to complete the scan due to claustrophobia. I did not realise the room and scanner wold be so small, when I opened my eyes when I was in the scanner I discovered my body was nearly touching the top of the machine. I became extremely claustrophobic asked to come out of the scan. The staff were extremely kind advised me to ask my doctor for a sedative if I was to return for another scan. I need a scan to assess the nerve damage to my neck and spine. I am not sure if I can return. You can request an NHS referral to the open scanner from your GP. Please let us know if we can help at all or if you have any questions about the referral process. Managed to have mri scan on Tuesday evening at the western general hospital now edinburgh. The staff were great so kind and caring, after my last experience in the mobile scanner. I spoke to my doctor about him referring me to your hospital, he said the area NHS would not refer me as your based in Newcastle. The doctor prescribed 3 Diazipan to calm me down, they worked in was able to staying scanner long enough to take the scans. Thank you for letting us know how it went. We do receive many referrals from Edinburgh and the NHS can refer patients from anywhere in the UK so it’s strange that your doctor thought that. We’re so pleased that you had a better experience though! Apologies, we are not aware of any open MRI scanners in that area. It may be best to contact your GP to discuss options. How much is it for a head scan and a full body scan. The price of a head/brain scan costs £380. We don’t offer full body MRI scans as they are not as effective as scanning the area of the body in question, but one area generally costs £380. Please get in touch if you have any questions about the referral process.